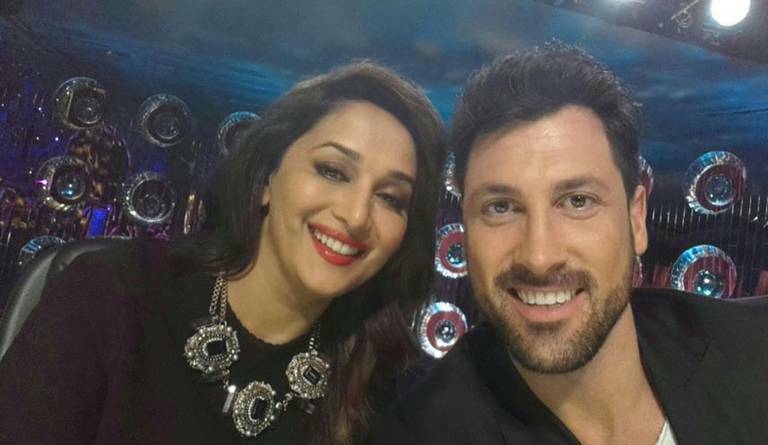 Mumbai, June 22 (IANS) Ukranian ballroom dance expert Maksim Chmerkovskiy is on his maiden visit to India as the first international judge of reality TV show “Jhalak Dikhhla Jaa”. And there are reports about him being unhappy as a judge on the dance show. But he says he is having a “blast”. Maksim, it’s being reported that you are upset with the set-up at ‘Jhalak Dikhhla Jaa’ because you cannot speak or follow the Hindi language? That’s not true. I am having a blast. It’s all good, don’t worry. It’s going really great. And that report is bull****. I am a very adaptable person. I am open to all kinds of experience. I came to India and to ‘Jhalak Dikhhla Jaa’ to embrace a new language and culture. I want to understand Bollywood dancing. This is a brilliant once-in-a-lifetime opportunity for me to get acquainted with a new culture. And I am enjoying every moment of it. But the language is a barrier. Your statements are ticker-translated on screen while you can’t understand any of what the contestants and your fellow-judges have to say? Of course. But I was prepared to face all of this. I had hoped that the production team would understand there would be difficulties. And everyone is helping out. The judges are constantly helping me out. I sit between Madhuri Dixit and Karan Johar. They’re constantly telling me what’s going on. The hosts are also helping me out all the time. It helps that the show is taped and doesn’t go on air live. So, they stop the shooting and explain what’s going on. The experience that I am getting here is not something you get in a classroom. You are from a non-Western culture, to begin with. So grappling with alien cultures is not new to you? Exactly. I was quite young when we immigrated from the Ukraine to America. So, I am not new to the experience of learning about a new culture. Also, I live in New York which is a cultural melting pot. I’ve friends from all over the world…India, China, Africa, Germany, the Ukraine. I’ve travelled all over the world and accumulated a vast amount of experiences from everywhere. I lived in Italy for a year. I learnt Italian. I am used to learning about cultures from the scratch. How different is ‘Jhalak Dikhhla Jaa’ from ‘Dancing With The Stars’? Very different. To begin with, our show ‘Dancing With The Stars’ was live and shot in two hours. ‘Jhalak Dikhhla Jaa’ is shot over the entire day and not live. When I came here first, I didn’t know how to react. It was all so new to me. But now I am having a blast. Five hours of shooting swishes by as though it is 30 minutes. I’ve spent nine years being a contemporary dancer in the United States. Bollywood dancing is a completely different experience. But what I’ve noticed is that the contestants have a lot more respect for the judges. I’ve just begun to realize that Madhuri is a legendary figure. And Karan Johar has a track-record of successful films. I had come here for a new experience. I thought I’d be a good judge on the show. But now I’ve to be even better than just a good judge in order to live up to the standards on the show. Your journey from the Ukraine to the United States reads like the script of a film. Have you ever thought of a film on your life? Contrary to how I come across on television, I come from a very humble background. I’ve been through a lot. I’ve been approached to write a book. It makes commercial sense. But I still feel I am too young and not accomplished enough to tell my story. My brother and I are still learning, trying to understand various cultures, trying to understand what’s going on in the world. I will write my story one day. And I’ll do it only if I feel that my story and those experiences that I persevered through though they were not all pleasant, will help of some people to make something of their lives.It has to be done not just for commercial purposes.I do have a fascinating life. But more than my own life I’d love to write about my parents. They gave me and my brother a life we could never even dream of. You’ve been linked with some of the most beautiful women in America. How do you reconcile the two very different worlds where you come from and where success has taken you? It’s the kind of upbringing my brother and I got. Our dad taught me there are are no irreplaceable people in this world. So, you’ve to earn, cherish and value the place that you are in. The place you get in life you have to make your own and try to make it better. We migrated 20 years ago. But we went through 10 to 12 years of acute struggle. We survived because our family was headstrong about its values. We never allowed ourselves to be swayed by circumstances. I wish I’ve inherited some of my parents’ values. That’s all that matters. What do you return to after your stint in ‘Jhalak Dikhhla Jaa’? I’ve got a bunch of projects lined up. There are many offers on the table. I am welcoming all the experiences with open arms.I count myself blessed. There’s political unrest everywhere. I never thought I’d hear people cry on CNN for help in my country and language (Ukrainian). That makes me feel very humble about the opportunities that I’ve received in life. I feel very blessed. Hopefully one day you’ll be able to help others like you from your homeland?